Aaaaaaaargh! I can’t stand it! I just can’t stand it! Why on earth was Peanuts so popular? My kids still read Calvin and Hobbes, because it’s laugh-out-loud funny. For the most part, Peanuts isn’t. Other than to mock its posthumous inclusion in the Sunday funnies, the fruit of my loins have ignored Peanuts altogether. So why do I adore it? You have to admit that there’s never been anything like it, before or since. It doesn’t go for belly laughs very often. Instead, it’s gentle and whimsical, filled with ponderous philosophical musings, and more than a little sad. It spoke to me, I think, because I was Charlie Brown. Yeah, yeah, I know. Everyone thinks they’re Charlie Brown. But all the pathetic clichés really applied to me. I was picked last for every team. (Sometimes the teams even fought over which side had to take me.) I cried readily as a little kid, so I was an easy target for a succession of bullies from first through eighth grade. I was often mopey and sullen, and my young life was dominated by a string of little red-headed girl surrogates that I would admire from afar with no hope of requital. You didn’t need to waste any time feeling sorry for me, however, because I felt sorry enough for myself to compensate for it all. So, naturally, Charlie Brown was an inspiration to me. Except I that’s using the term “inspiration” rather loosely. He didn’t spur me on to great heights of accomplishment; he just reminded me that I wasn’t alone in my loserdom. In some ways, that was enough. We had all the little paperback books with the reprinted cartoons. I was so proud of myself because I could read them all in one sitting, which gave me the illusion of accomplishment. There was a much more comprehensive hardcover Peanuts collection at the elementary school library that I wanted to get my hands on, but it was always checked out, and the reserve wait was something like two months – an eternity in elementary school years. The book had thousands of strips reproduced in a single volume, and the book was worth its weight in gold. So while I was waiting for the Peanuts horde to become available at the library, I would listen to an old record we had lying around. It had Charlie Brown on the front, and pictures of grown-ups trying to dress up like Charlie Brown on the back, along with some groovy colored boxes, which I only assumed were colored, because the pics were black and white. 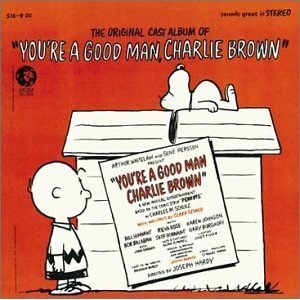 I didn’t really understand why adults were pretending to be Charlie Brown, but I was pretty sure that if Charlie Brown ever grew up, he would look like the guy on the back of the record. I listened to that thing until it was scratched beyond recognition. I knew every song backwards and forwards. Yet I had no idea how big a role that particular show would play in my life in the decade that followed, up to and including July 13, 1985.